Distinguished Public Lecture on Preventing Math Phobia — UTech, Ja. 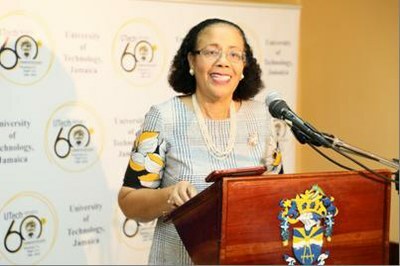 Dr Angela Samuels Harris, retired mathematics educator and former Principal of the Montego Bay Community College delivering the University of Technology, Jamaica 60th Anniversary Distinguished Lecture on January 24, 2019 at the UTech, Jamaica Western Campus, Montego Bay. Dr. Angela Samuels Harris, retired mathematics educator and former principal of the Montego Bay Community College delivered the University of Technology, Jamaica 60th Anniversary Distinguished Public Lecture on the topic “Mathematics ‘Head-ucation’ – Preventing Math Phobia” on Thursday, January 24, 2019 at the University’s Western Campus, Montego Bay. In her very informative lecture, Dr. Samuels Harris demystified many of the perceived complexities of Mathematics, while emphasising that math phobia and math anxiety can be overcome by shifting one’s thinking and approaches to the teaching and learning of the subject. 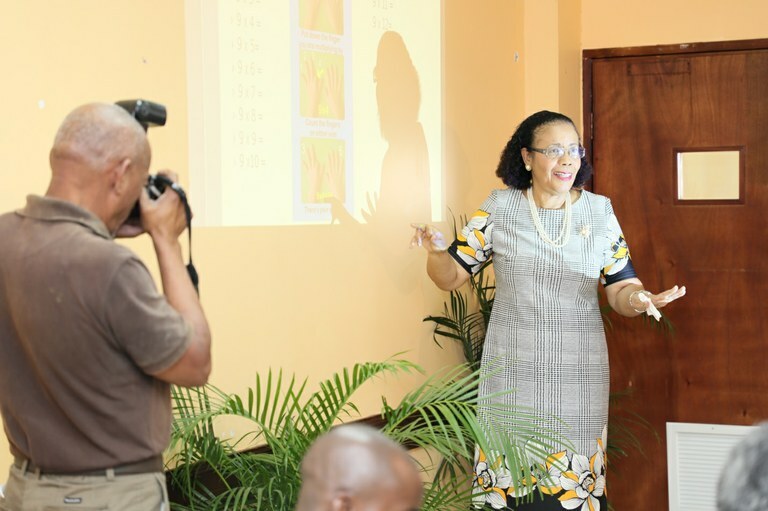 Throughout her engaging talk, the Mathematics educator shared on her vast experiences as a Math educator at different levels in the education system in Jamaica, the wider Caribbean and North America. She highlighted a number of occasions where she was able to transform student failure in mathematics to high achievement in the subject. Among the strategies she has utilised, was drawing on culturally specific experiences of students by using games, drama and music to aid them in their understanding of math concepts. Dr. Samuels Harris whose love for Mathematics led her to pursue both a Master of Education and Doctorate in Mathematics Education from Columbia University in New York, USA, also underscored the benefits of incorporating mathematics in everyday family life. Dr. Samuels Harris shared recent statistics on student underperformance in Mathematics at the primary and secondary levels in Jamaica. She noted 2017 data which showed that only 57% of students who sat the CSEC Mathematics examination achieved a passing grade. Pointing to performance in mathematics in the GSAT exam, for the period 2012 – 2017, she noted that despite improvements, the national average was 63%. She also pointed out that in the Grade 4 Numeracy Test for the same period, only 66.9% of students received mastery level. Dr. Samuels Harris concluded by encouraging students to be persistent in their pursuit, understanding and practise of Mathematics. Nine Times Table Trick: Dr. Samuels Harris demonstrates the use of the effective finger trick method which can be used to easily remember the 9 times table. 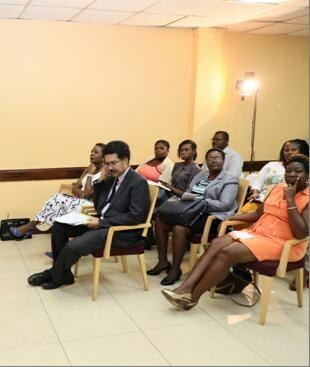 The lecture was chaired by Professor Stephen Vasciannie, President, UTech, Jamaica. 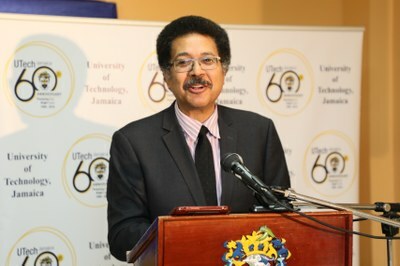 The President thanked Dr. Samuels Harris for accepting the University’s invitation to deliver the 60th Anniversary Distinguished Public Lecture, noting that the topic accords well with the University’s as well as the Ministry of Education’s national thrust to create opportunities to assist students to overcome their fear of mathematics and to improve overall national performance in the subject. 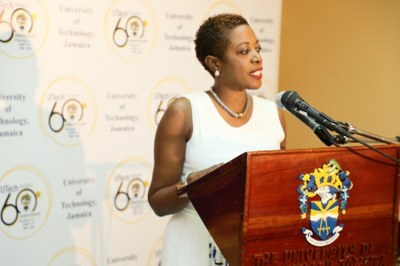 Ms. Sophia McIntosh, Coordinator, UTech, Jamaica Western Campus, in her remarks and introduction of the lecturer, shared some historical highlights of the University’s contribution to national development in areas such as business, the arts, humanities and the sciences. A robust question and answer session among the audience of educators, high school and tertiary level students, administrators and members of the media, followed the well-attended lecture. 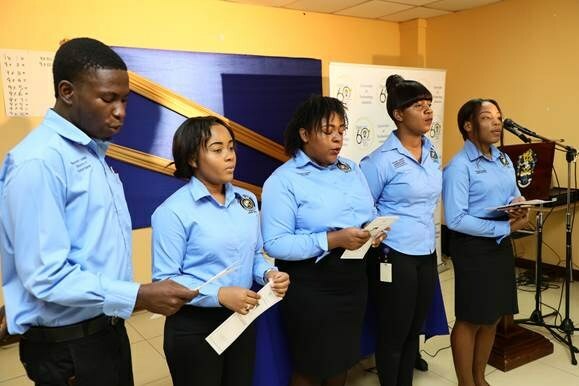 UTech, Jamaica Western Campus students lead the singing of the University Song. 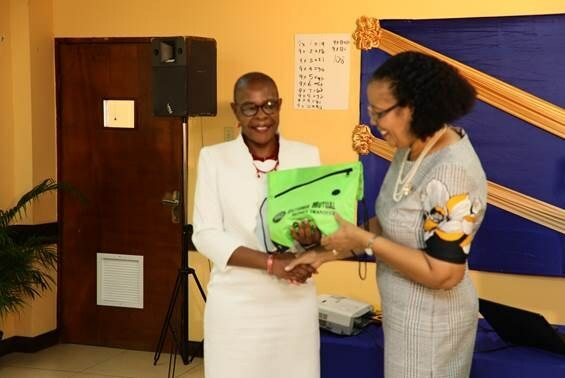 Dr Audrey Gittens (left) Lecturer/Programme Leader, UTech Jamaica Western Campus, who moved the Vote of Thanks, presents Dr. Samuels Harris with a gift.